This morning wasn’t just any morning. This morning I went to the Farmers’ Market in town. I packed up my folding poster, markers, and some personal definitions of peace. I added some flyers for the upcoming peace activities this upcoming week, and was ready to go. All the people at the Farmers’ Market were great. The vendors, the patrons, and especially the staff at the market. And, the weather couldn’t be better! Perfect September day. Yes, this was similar to a bunch of other times I packed up my peace supplies and went to talk to a group of people about peace, and personal definitions of peace. And yet, it wasn’t. I’ve talked with a number of church groups about peace. Yes, and some school groups, too. 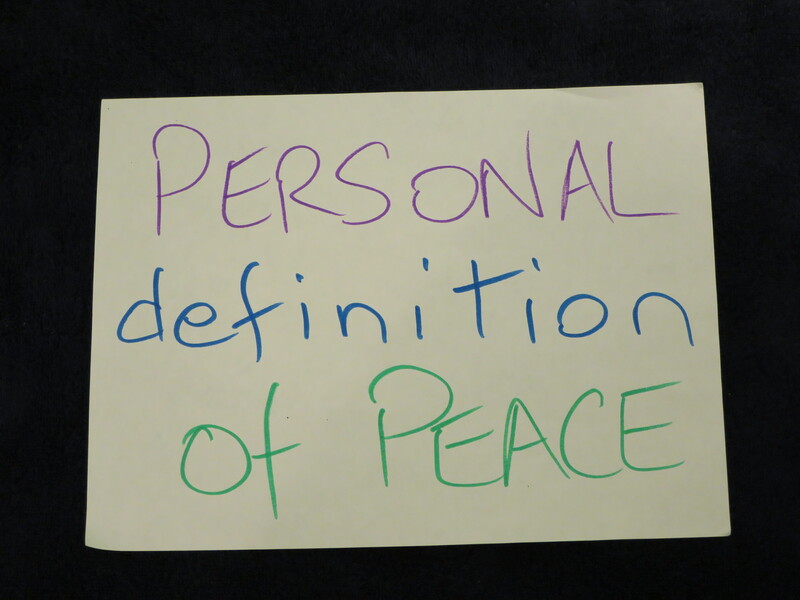 I went to a local mosque and asked a group there about their personal definitions of peace. In every instance, I asked them, “What is peace to you?” But, all of these groups had some background, had some prior warning that I would be there, and be asking them about definitions of peace. I did not have that advantage with the majority of the people at the Farmers’ Market. This was certainly okay! However, it did add some interest to my conversations this morning. Two of the best conversations I had were with young people. A girl, and two boys. All of them came straight up to my table, and engaged me in conversation. Both conversations got straight to the point, and I enjoyed them immensely. My children are grown, and I don’t often have the opportunity to talk with children. Refreshing, and engaging, to be sure. Personal definitions of peace. These can be wide-ranging. Personal and internal, certainly. Yet, also exterior, covering the community, the region, even the world. “What is peace, to you?” Something to think about, to be sure. God willing, each individual may be invited to think about a definition. And God willing, each of us could strive to find a way to make these definitions of peace come to pass. May it be so!